When it comes to dining room chandeliers, less is more is my approach. I’ve learned my lesson with glass chandeliers. We have a very simple one in our entry and it takes a lot of work to keep it sparkling. I love the look of lanterns for the kitchen and dining room, but keeping them clean would drive me crazy. For the dining room I wanted something big, but super simple. Serena & Lily has a few of my favorites. The best part is that they range in price from about $250 to $500. 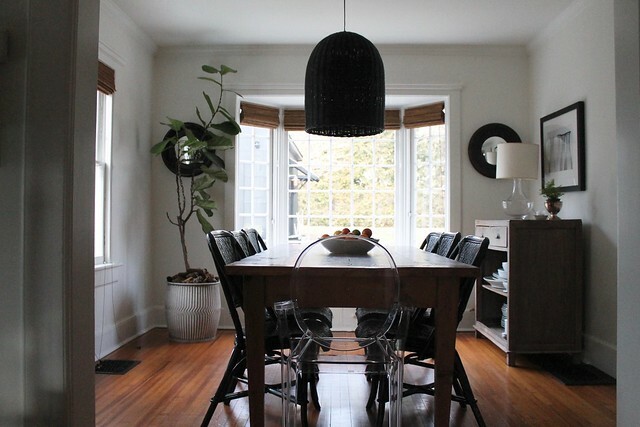 I like natural rattan, but the black Santa Barbara pendant was what we chose. Our house is old and the dining room is fairly small. This pendant fills the space and makes it a little modern. Having a small pendant in a small room makes the room look—well, small. A big pendant calls for a big light bulb like this one from west elm. And of course on a dimmer. The Santa Barbara Pendant gives a laid back look which is perfect for our house and family. The Yountville is quite large and would fill a two story entry or stairway in beach house in the best possible way. I have my eye on the small Capiz Chandelier for above our white Saarinen table. The light from a globe like the Capiz fills the room with nice soft lighting. 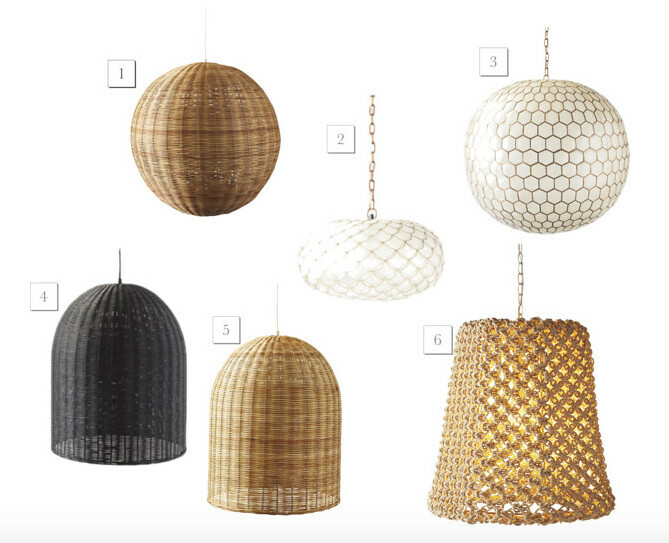 So what do you think of woven pendants for the dining room? Too casual? Or just right? Yesterday I went to Terrain to look for a small olive tree or something for the dining room table. 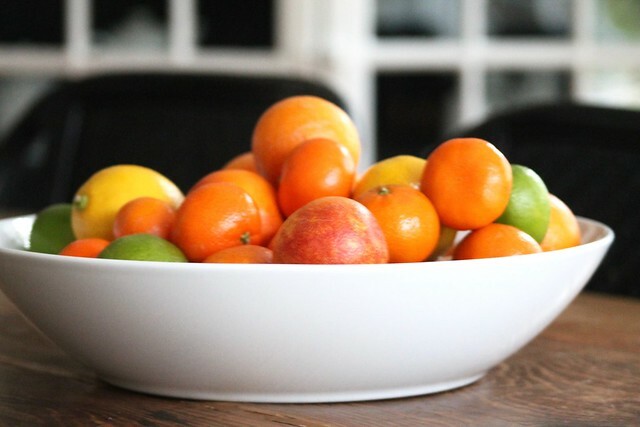 I ended up with one tiny Maidenhair fern and then stopped at Trader Joe’s to fill a bowl with winter citrus. Hi Annie, I sent you an email but didn’t hear back, so thought I would try commenting. I wondered if you could possibly share where you found your opening shelving that you have in your kitchen? We are in the middle of a kitchen remodel and I am trying to find something similar. Thank you very much! I’m so sorry I did not respond. I try to answer every email. The open shelving was done by our cabinet builders, but what they did was put trim on the front and sides of the shelves to make them appear bigger. I will try to find the brackets we used. I bought them from a website, so I’m sure I can find something similar. I promise to get back by tomorrow. Good luck with your kitchen remodel. What a fun post to see your new chandelier (which looks great!) and see all the other S&L lighting options with great ideas where to use them. I really do like that Capiz! Love your dining room and its balance of color and transparency. Where did you find that lamp? The glass lamp is from Simon Pearce. I’ve had it for a long time, but I think they always have items similar. Thanks for reading!